Brad Kuvin’s editorial in the September issue of MetalForming magazine highlighted the automotive industry’s increased use of higher strength steels, especially the dual-phase grades. Increased fuel-efficiency requirements have dictated weight reductions achieved by higher strength and thinner gauges of steel components. To help meet these new requirements, the steel industry continues to explore new approaches to increase strength and reduce cost and welding problems. The automotive industry tends to be a beta test site for many of these new steels because of the quantity of special steels utilized. Not a supplier to the automotive industry? These new steels could easily be the steels you will be using in the future. Learn about them now and you can be one-step ahead of your competition. Many decades ago, higher strength steels were made by adding large amounts of carbon or by cold working the coils. While these were successful in achieving higher strengths at lower cost, the maximum amount of stretchability was very limited. In the 1960s, metallurgists began modifying the basic microstructure of aluminum-killed draw-quality (AKDQ) steels. Grain size was reduced. Iron atoms in the unit cell were replaced with atoms of other elements that are larger or smaller than the iron atom (substitutional strengthening). Some atoms were inserted within the iron lattice iInterstitial strengthening). Various combinations of these changes in microstructure are called thermal mechanical strengthening. These steels are the high-strength low-alloy (HSLA) steels. The yield strength of HSLA steels increases as more microstructural modifications are made. Initially their yield strengths were in the 35 to 50 KSI range. Today the most common yield strength upper limit is 80 KSI. 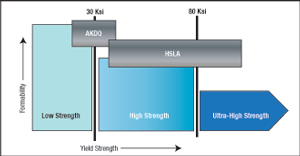 However, one steel mill in Europe is providing HSLA type steels in the 100 to 110 KSI yield strength range. Fig. 1—Schematic showing the terms used to define different levels of strength. In North America these higher strength steels were specified by yield strength. However, a special designation also was assigned based on an arbitrary range of yield and/or tensile strengths (Fig. 1). Using this typical chart to explain higher strength steels has several problems. First, the boundaries of the zones are arbitrary and have been changed. Second, some charts have three zones (as shown) while others have four zones that include medium strength. Third, different types of steels have a number of grades or levels of yield strength. As shown in Fig. 1, the HSLA steel grades exist in two different strength zones. The real fallacy is AKDQ steel. This is considered a low-strength steel, but many coils exceed the 30.5 KSI boundary line and can be called high-strength steel. Finally, the drop in the height of the bars implies a discontinuous drop in formability when transitioning from low-strength to high-strength to ultra-high-strength. In the real world, however, the stretchability and bendability of these traditional steels decrease in a gradual continuum as various formability parameters decrease with increasing strength. During the last three decades, the introduction of advanced high strength steels (AHSS) has forced suppliers and users to rethink how higher strength steels are viewed. Metallurgists have taken the traditional single phase (ferritic) microstructure and added other phases (martensite, retained austenite and bainite for example) to create multiphase steels with interesting and sometimes unique properties and behavior. 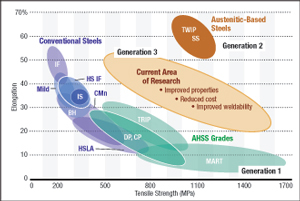 To relate these AHSS to the traditional higher strength steels, a new graphic (Fig. 2) called a banana curve displays their relationship to the traditional higher strength steels. While this graph can be based on yield strength, the tensile strength is commonly used because AHSS are specified by tensile strength. This graphic also can illustrate where current research and development is focused for the next generations of higher strength steels. Fig. 2—Graph showing the Elongation-Tensile Strength relationships of current and future higher strength steels. Courtesy of WorldAutoSteel. Two improvement targets for AHSS are shown in Fig. 2. The first target is to improve the stretchability and bendability of the steels without changing the yield strength. These two new steels are the dual-phase (DP) steel and the transformation induced plasticity (TRIP) steel mentioned in the editorial by Brad Kuvin. DP steel has the longest production history and is the AHSS most commonly used. Some TRIP steel is used in production but most is still under evaluation. The second target is to improve the strengths without changing the stretchability or bendability. These are the complex phase (CP) steel and the martensitic (MS) steel. As one might imagine, the extremely high yield and tensile strengths of the strongest MS grade creates stretchability and bendability problems. These problems can be solved by changing the processing to hot forming. Instead of starting with a very strong MS steel, a common boron-based steel is heated to 850 C. At this temperature the strength of the steel is extremely low and the steel is highly formable. The preheated blank is inserted into a chilled die, quickly formed, and then quenched as it remains in the die until the microstructure changes to martensite. The benefits are the ability to form complex shapes; an extremely high strength martensitic final structure; and no problems with springback. The disadvantage is a longer cycle time in the die. The current AHSS are shown in Fig. 2 as Generation 1. In the upper right corner of the graphic is a Generation 2 steel called twinning induced plasticity (TWIP) already undergoing production studies. This steel has a very high n-value for excellent stretchability. This steel has a very high austenite component. Another steel with a very high austenite component is the 300 series of stainless steel, which historically has been called the “formable” high strength steel. When plotted in Fig. 2, the 301 and 304 stainless-steel alloys would be within the band of Generation 2. The current problems with Generation 2 steels are the high alloying cost and the resulting poorer weldability. The question also has been raised about the real need for such a dramatic improvement in formability parameters. Therefore, for the past several years researchers at various universities and steel companies have been attempting to develop higher strength steels that fall into a Generation 3 band. These steels would have less cost and easier joining procedures than Generation 2, but still have the ability to make more complex parts than the current AHSS.